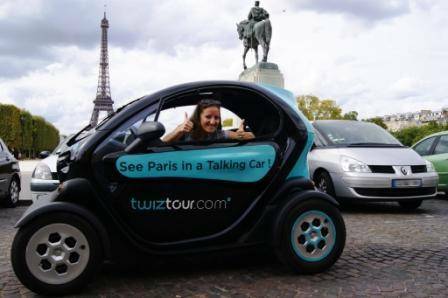 Twiztour, Fun Electric Twizy Car Tour in Paris! Have you ever seen this cartoon that represents Europeans through their most stereotypical but still funny flaws? 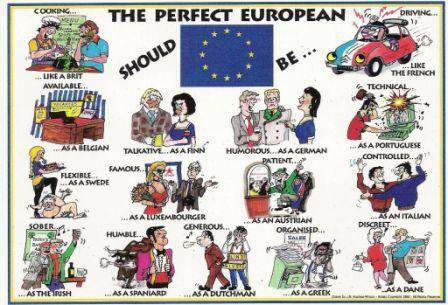 The perfect European should cook like a Brit, organize like a Greek, be flexible as a Finnish, be as humble as a Spanish, stay sober as an Irish … and should drive like a Frenchman! The bad reputation of French drivers is probably a result of the image of anarchy at the Place de l’Etoile, one of the largest squares of Paris, especially at rush hour. Driving in Paris has become almost a myth: if you know how to drive in Paris, you’ll know how to drive in any other big city in Europe! And therefore, some tourists who would love to explore the city by themselves by car do not dare to venture behind the wheel, for fear of being stopped after only 20 meters! 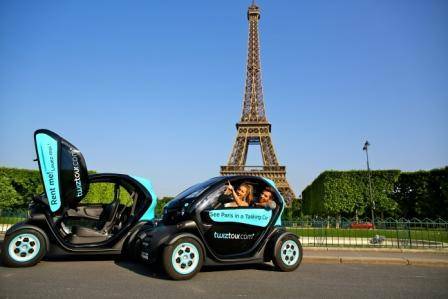 The young start-up, Twiztour, came up with a brilliant solution, permitting visitors to drive safely in Paris. 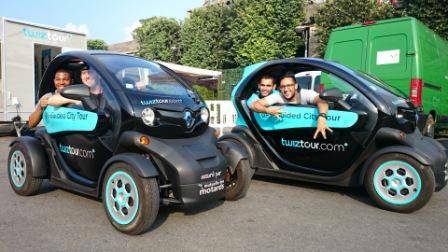 By driving one of these funny electric cars called Twizy, from the French car-maker Renault, the tourist can finally discover the city at his own pace from the road. Twiztour has implemented various formulas for you to choose the option that best suits you to explore the city. All tours depart from the Eiffel Tower, a particularly convenient location. For classical tours, the company gives you a pre-programmed GPS, where all you have to do is follow the route. There are small devices installed at destinations along the route for you to follow. Don’t worry, you won’t miss any information you would hear from a tour guide, because the GPS has all you need to know programmed into it. “We now turn left into the street… Take a look right now, you can see the famous store, known for such and such a reason.” And in case you miss a turn and find yourself off the planned route, the GPS will help you find the way to get back on track. Three itineraries, all starting from the Eiffel Tower, are currently available: in one hour. “The Essential” allows you explore the west of Paris and most of its symbolic monuments: the Eiffel Tower, of course, but also the Arc de Triomphe, the Invalides and the Place de la Concorde. “The Spectacular”, in 2 hours, is a longer drive, where you will be able to discover the historic center of Paris: Opéra, Place Vendôme, the Louvre, Notre Dame, the Musée d’Orsay, etc. Finally, the “Unforgettable Montmartre” (in 3 hours) is a good option for visitors who have already seen the historical center and would like to explore other parts of the city. During this tour, you will drive to the neighbourhood of Montmartre, where you will be introduced to its narrow streets and village atmosphere. Since Twiztour is a young and dynamic company, other pre-programmed itineraries are currently in preparation. There are also other options available. If you fear that you might spend more time staring at the GPS instead of admiring the monuments and enjoying the view, you might want to try the VIP tour. In this case, you are still driving your Twizy, but you no longer need to focus on a GPS because you simply follow another Twizy which will be your personal guide. After discussing the duration and the sites to see with your guide, all you have to do is follow the guide on the route. Connected to your personal guide by a walkie talkie, you can ask all the questions you want while exploring the city. In addition, other options include: delivery and pick-up of the Twizy in front of your hotel and the tour VIP Deluxe with champagne and canapés available at photo stops. T he Twizy is a small two-seater electric car with an innovative design. Placed one behind the other, not side by side, the driver and passenger sit comfortably. Don’t worry about leg room, there is plenty of space even for tall people. With a 100% electric motor, the Twizy is completely silent, but it does not go unnoticed in the streets. Its friendly design, with its butterfly doors, made more than one pedestrian turn around to watch us. We had come to admire the attractions of Paris, but what a funny feeling to see that we had become an attraction ourselves, with other tourists and even Parisians taking pictures of us! Of course, one must keep in mind that Twizy is a car made for the city and not for the road. Those who enjoy feedback or a responsive car while driving may find that Twizy lacks a bit of punch, but we must understand that to visit Paris and enjoy the scenery, it is necessary to drive at a slower pace. In addition, the suspension system is not really that of a Rolls Royce, as we can easily feel the uneven ground due to the cobblestones. But once again, given that it is advised to drive slowly and take one’s time, this should not really bother you. I had recommended this activity to a young couple, Ingrid and Raphaël, while Ingrid was 7 months pregnant. Aware of her pregnancy, the Twiztour team had prepared extra pillows for Ingrid to sit comfortably and enjoy the tour. Ingrid found the activity to be enjoyable, although a little bumpy in her condition, but very doable, when being warned and taking a few precautions. 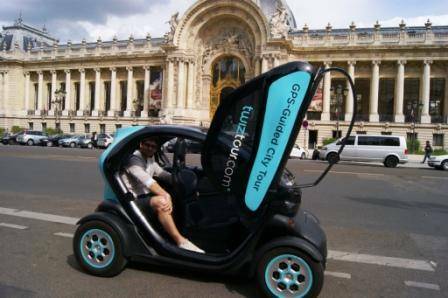 Compared to a conventional tour in a city bus, Twizy provides you with the option to stop at any particular monument you want. You can take photos at your own pace, without being bothered by other tourists who are trying to get the same photo of the same monument from the same angle as you for the 10 seconds you have when you pass it on a tour bus. In addition, you really have the impression of “living in the city”, more than visiting it as a mere spectator. Like true Parisians, you experience driving in Paris, but without the stress of looking for directions and avoiding places where you need to drive like a Parisian like the Place de l’Etoile! This is another way to capture “your Paris” and for those who want a truly personalized experience, the Twiztour is an option that combines fun, unusualness and authenticity! Please note the activity is accessible to anyone with a driver’s license from any country in the world.